The author is the famous grandfather of BV Raman. 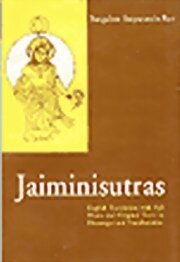 This is a translation with full notes on the first two Adhyayas or literally lectures by the Sage Jaimini. Professor Rao is the only scholor in India to have attempted an English translation of Jaiminisutras which deal with a system of astrology that has no parallel in the existing methods. In this book English translation with full notes & Original texts in Devanagri & teansliteration.